"Excellent choice of pieces and lovely playing!" 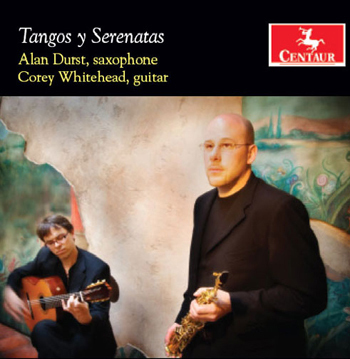 "Alan Durst and Corey Whitehead have put together a splendid collection of saxophone and guitar music. The variety of compositions, all masterly performed, captures many moods, from serene sensitivity to gregarious excitement. This recording amply demonstrates the potential of the saxophone guitar duo, and reminds us of the possibilities for the saxophone in virtually any chamber setting. Alan Durst's tone, control, and nuance provide further evidence that the saxophone is the closest instrument to the human voice, and can be a modern substitute in one of music's oldest combinations. "The Mediterranean Beauty is a standout on this heartfelt CD. You have a great feel for Piazzolla's "Histore du Tango" Beautiful sound, rhythmic finesse and energy! Bravo, equally impressive is your guitarist Corey, masterful playing with a clear clean sound and effective vibrato, just great." "Tangos y Serenatas is one of my favorite CDs so far this year. Featuring a diverse blend of styles from different contemporary composers, this CD will suit a number of radio formats. Although classical saxophone and guitar are not a common combination, the playing of Durst and Whitehead complement each other very well. The most familiar piece will be Astor Piazzolla's Histoire du Tango. Originally written for flute and guitar, Durst astounds with his technically brilliant yet emotional performance on soprano saxophone. My other favorites on this disc are L.A. Tango Nuevo by Adrienne Albert  particularly nice for world music radio formats  and Joropo Jam by Benjamin Boone. Overall, the CD is truly a standout for its diversity and the talented playing of Alan Durst and Corey Whitehead." "A seriously wonderful disc; excellent choice of music - including great new works by Carlson, Albert and others -as well as a thoroughly idiomatic and passionately rendered "Histoire du tango". And the playing is an unalloyed delight!" "This is cafe music, but good cafe music. The pieces are thoughtfully written and arranged; the opening number, Boone's 'Joropo Jam'. is rhythmically catchy and makes an excellent first impression." "On this CD the saxophone is joined by guitarist Corey Whitehead creating a duo of dazzling nuances and sound textures that are breathtaking. Alan Durst is the saxophone half of this duo who manage to capture the delicate moods of the music while at the same time capturing the implied lightheartedness of the moment. They also combine to give us passion contained in the compositions themselves."